The U.S. Army teamed up with cartoonist and graphic artist Will Eisner to produce teaching tools for U.S. soldiers in a medium that they could easily understand. 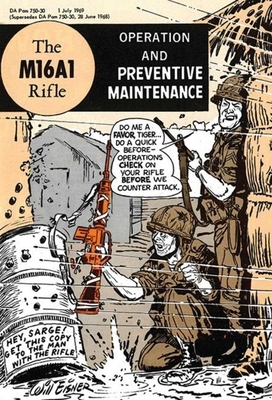 The M16A1 Rifle: Operation and Preventive Maintenance, first printed in 1969, features a female narrator who instructs GIs on the proper care of their AR-15 (military name M16A1) rifles—firearms notorious for jamming and malfunctioning. More than a simple manual and step-by-step guide, this unconventional yet important military document tried to appeal to soldiers with suggestive chapter titles such as “How to Strip Your Baby,” “What to Do in a Jam,” “Sweet 16,” and “All the Way with Négligé.” A copy of the thirty-two-page booklet was issued to nearly every soldier serving in Vietnam.